Are you one of the two million homeowners who will remodel your kitchen this year? If so, the right planning will help you avoid the common pitfalls of remodeling. With a smooth kitchen renovation experience, you can spend more time enjoying the new features of your kitchen and less time worrying over unexpected problems. A to-scale drawing or architectural rendering of your current kitchen. This should include windows, doors, heating, plumbing lines, and electrical outlets. A full list of your goals. Address what you want in terms of storage, style, features, technology, and customization. A compilation of ideas like pictures, products, materials, and suggestions that are influencing your vision. The possibilities of a newly renovated kitchen can be intoxicating. Once you get started, it’s hard to say no to new ideas. Why not add in a customized, built-in dog bed in the corner? Hold yourself accountable to your original plan and try not to stray too far. Otherwise, you risk ending up with a kitchen that is far too expensive and complex than you wanted. Looking at model kitchens, it’s easy to get swept away in the look and design of your ultimate remodeled kitchen, but you can’t forget about the small details that will help make your kitchen functional and comfortable. Think about under-cabinet lighting, strategic storage, a range hood, hidden outlets, and other components that will make your kitchen more pleasant to use each day. How many people usually cook in the kitchen? Do you enjoy serious cooking, casual meals, or the microwave? Is your kitchen also the hub of your home and social gatherings? What would your ultimate kitchen luxury be? Perseverance and attention-to-detail will all pay off when your kitchen remodel is a success! 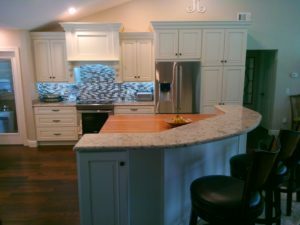 Call (813) 964-9676 to get started with Kitchen Creations Cabinet and Countertop Specialists in Tampa today.